Wader Quest: Rolf Grantsau. Grand old master of Brazilian ornithology 1928-2015. Rolf Grantsau. Grand old master of Brazilian ornithology 1928-2015. 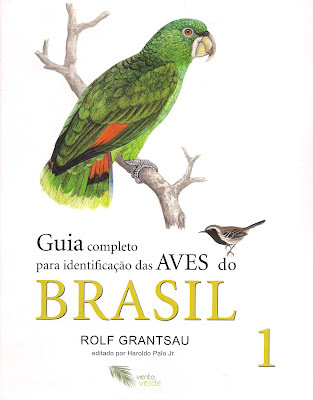 When we lived in Brazil Elis and I had the privilege to meet Rolf Grantsau one of Brazil's greatest ornithologists who was not just a great ornithologist but also a very kind and affable man with whom we enjoyed some very interesting conversations. Rolf Grantsau was born 25th March 1928 in Kiel in Germany. He moved to Brazil in 1962 with his wife Ilse and children Marion and Ingo to fulfil a life long ambition; to study hummingbirds. It is for this study that he is perhaps best known. On my first visit to Brazil I was presented with a copy of his seminal work Os beija-flores do Brazil (The Hummingbirds of Brazil) a gift that I will always cherish and which sadly I was never able to get signed by Rolf on our infrequent, unplanned encounters. I was luckier though with his two volume work on the identification of Brazilian birds the first volume of which he signed for Elis and me in May 2011 at the Brazilian bird fair called Avistar; which is what he is doing in the photo above. The book Rolf signed for Elis and me. In 2008 in Atualidades Ornitológicas 142 he and co-writer Lima proposed the existence of a new subspecies of Wilson's Plover in Brazil and called it Charadrius wilsonia brasiliensis. They pointed out that the species was not simply a non-breeding visitor to Brazil, but that it bred in small numbers along the coast of Brazil from Amapá in the north where Brazil borders French Guiana south to Northern Bahia. Although not accepted by all authorities the Handbook of the birds of the World refers to this as a different subspecies bringing the accepted total to four. However, the name offered by Grantsau and Lima C. w. brasiliensis was not accepted as the name crassirostris had previously been assigned to the same population although this name had been absorbed into wilsonia and then cinnamominus. Grantsau and Lima argued that the name cinnamominus was invalid as the type specimen no longer existed and the description was made from a specimen with no proper details of its provenance but this has not been generally accepted and so, as is the way with these things, the new race was called crassirostris and attributed to Spix 1825. Wilson's Plover Charadrius wilsonia probably of the race wilsonia, Galveston, Texas, 2013. Rolf Grantsau died after suffering from throat cancer on 25th June 2015.